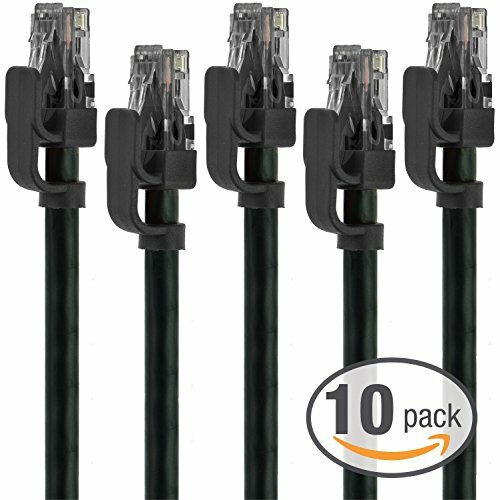 Mediabridge RJ45 Cat6 Ethernet Patch Cable The Mediabridge Cat6 Snagless Network Patch Cables are intended for wired home and office networks. They offer universal connectivity to computers and network components, such as routers, switch boxes, network printers, network attached storage (NAS) devices, VoIP phones, and PoE devices. Built for Future-Proof Speed and Reliable Connectivity This cable provides exceptional transmission performance and low signal losses. It supports up to 550 MHz and is suitable for Fast Ethernet, Gigabit Ethernet, and 10-Gigabit Ethernet. Specifications - Cable Type: CAT6 4-Pair UTP - Outside Diameter: 5.8 0.3 mm (0.23 0.01 inch) - Connector Type: RJ45 - Conductor Material: Stranded Bare Copper- Contact Plating: 50 Micron Gold Plated - Conductor Gauge: 24 AWG - Cable Performance: Up to 550 MHz - Cable Structure: Stranded - UL Listed, TIA/EIA 568-B.2 Verified - Power over Ethernet (PoE) and Voice over IP (VoIP) Compliant Package Contents -5 x Cat6 Ethernet Cables.